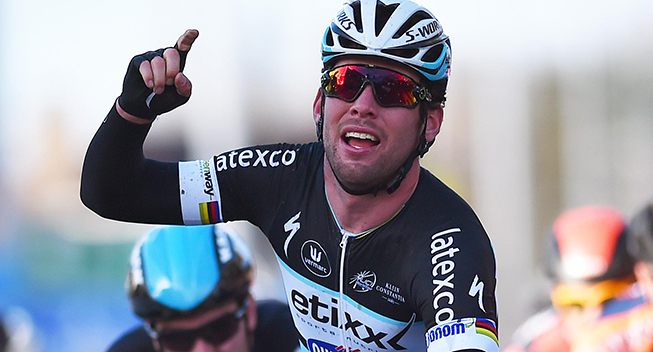 Mark Cavendish (Etixx-QuickStep) continued his love affair with the Tour of California when he made it two in a row by winning the second stage of the biggest American race. In a photo finish at the end of a confusing sprint, he narrowly held off Peter Sagan (Tinkoff-Saxo) and Wouter Wippert (Drapac) to take the victory and extend his overall lead. One year ago Mark Cavendish returned to the Tour of California with great success as he won three stages in the biggest American race. This year he is back in the United States chasing more success and he has got the race off to a flying start. Yesterday he took a hugely dominant win when he completed a perfect lead-out from Mark Renshaw in Sacramento on the opening stage. Today he took win number 2 when he again came out on top in a bunch sprint. However, the win came in completely different circumstances as the Etixx-QuickStep team ran out of power too early. Instead, it was Peter Sagan who was given the perfect lead-out and Cavendish had to use all his speed to come past the Slovakian. Entering the final 12km, a strong 4-rider break with Daniel Oss (BMC), Luis Romero (Jamis), Markel Irizar (Trek) and Robin Carpenter (Hincapie) still had an advantage of a minute and Etixx-QuickStep and Tinkoff-Saxo were chasing hard with Maciej Bodnar, Guillaume van Keirsbulck and Yves Lampaert. At this point, the Optum team lined out their entire team on the front while Romero was no longer able to work in the break. It was a short-lived effort from the American though and instead Bodnar, Van Keirsbulck and Lampaert went back to work. Optum continued to work with Etixx-QuickStep and Tinkoff-Saxo ad they entered the final 10km with a deficit of just 35 seconds. At this point, a big crash brought down several riders. Warren Barguil (Giant-Alpecin), Fred Rodriguez (Jelly Belly) and a Jamis rider were most badly affected but the incident also took down sprinter Tom Van Asbroeck (LottoNL-Jumbo). The peloton had been split into two big groups and the first bunch was not slowing down. Meanwhile, Romero was distanced from the break and he was back in the fold as they started the first lap of the circuit. Drapac now took control with Travis Meyer taking a huge turn and they remained on the front for a while. However, the progress stalled as the gap stabilized around 25 seconds. Optum again hit the front just as theyr entered the finishing straight for the penultimate time and just as they crossed the line, the break was caught. Matteo Trentin now hit the front for Etixx-QuickStep but as hew slowed down a Smartstop rider took a turn. Trentin again hit the front but it was still a waiting game until Matti Breschel hit the front for Tinkoff-Saxo. He slowed down to find back to his teammates and it was again Trentin who took over. Etixx, Tinkoff and Drapac were lined out on the front until Tinkoff took control with Breschel and Michael Mørkøv. With two kilometres to go, it was again Etixx-QuickStep on the front with Julian Alaphilippe leading Mark Renshaw and Cavendish. The Frenchman swung off with 1.2km to and so it was Mørkøv who took over while Renshaw and Cavendish slotted into third and fourth. The Dane remained on the front until while the sprint trains foufh for position. Bennati, Renshaw, Cavendish and Sagan were lined out on the front as they took the final turn where Sagan did a smart move to push Renshaw away and getting onto Bennati’s wheel. Moments later the Italian swung off and it was Wouter Wippert who launched a long sprint. Sagan got into his slipstream while Cavendish had to start the sprint from third position and as Sagan passed the Dutchman on the left, Cavendish shot forward on the right. No one celebrated as they crossed the line but it was Cavendish who had taken the win. Courtesy of bonus seconds, he extended his overall lead over Sagan to 8 seconds but his time in yellow will come to an end tomorrow. The third stage includes the firsts serious climbing as the riders will first tackle a smaller climber before they get to the big Mount Hamilton in the second half. The summit comes with 48.2km to go and then there’s another short climb during the downhill run to the finishing city of San Jose. The final 10km are mainly slightly uphill, with the final kilometre averaging around 6%. After the opening sprint stage, the sprinters were again expected to shine in stage 2 which brought the riders over 193.7km from Nevada City to Lodi. After an undulating but mainly descending first half, the riders reached the completely flat second part that ended with 2 laps of a flat 3.6km circuit in Lodi. The riders had great weather when they gathered for the start in Nevada City and like yesterday, tget got the race off to a fast beginning with numerous attacks. After a few kilometres, William Clarke (Drapac), Tanner Putt (Unitedhealthcare), Daniel Eaton (Axeon), Evan Huffmann (Smartstop), Jacob Rathe (Jelly Belly), Carson Miller (Jamis) and Will Routley (Optum) got a small advantage to form a first promising move but they were brought back at the 6km mark. Oscar Clark (Hincapite) launched the next attack on a small climb and managed to build a 10-second advantage before he was brought back. Daniel Oss (BMC) and Markel Irizar (Trek) countered and this laid the foundation to the early break as the peloton slowed down. Luis Romero Amaran (Jamis) took off in pursuit and when the escapees had an advantage of 1.20, he was trailing by 50 seconds. He was later joined by Robin Carpenter (Hincapie) and those two riders made it up to the leader after 28km of racing. At this point the gap was 2.55 and now Etixx-QuickStep had taken control of the peloton but they still allowed the gap to grow. When Carpenter beat Irizar and Romero in the first intermediate sprint, it was 4.40. At the 50km mark, the gap was 5 minutes and moments later the escapees reached the first climb of the race. Here Carpenter attacked to win the KOM sprint ahead of Oss, Irizar and Amaran to become the first leader of the mountains classification. Oss and Carpenter sprinted for the points in the second intermediate sprint, and it was the American who came out of top followed by Irizar and Oss. At this point, the gap was still 5.10. Etixx-QuickStep were controlling the peloton and now started to accelerate. With 102km to go, they had brought it down to 3.40. A little later, Carpenter took sprint win number 3 as he beat Irizar and Oss in the final fight for points and seconds. At this point, the gap was still 3.35. With 80km to go, the gap was down to 2.30 but the escapees now responded to the faster pace, extending the gap to 3.20. In the peloton, Guillaume Van Keirsbulck and Martin Velits were working in the peloton and they were now getting some assistance from Jesus Hernandez (Tinkoff-Saxo). With 65km to go, the gap had gone out to 3.45 and this was the signal for Etixx-QuickStep to accelerate. As they entered the final 60km, Stijn Vandenbergh replaced Van Keirsbulck on the front and started to work with Velits and Hernandez. Meanwhile, Warren Barguil (Giant-Alpecin) worked his way back to the peloton after a mechanical. With 55km to go, the gap was still 3.40 but now the peloton significantly upped the pace as they hit a crosswinds section. Cannondale-Garmin hit the front, with Lasse Norman leading his teammate. Sky also moved up, with Xabier Zandio keeping his teammates protected. However, the situation calmed down after a few kilometres and so Hernandez, Vandenbergh and Velits went back to work. That was pleasant for Maarten Wynants (LottoNL) as it made it easier for him to get back after a puncture. With 45km to go, the gap had gone down to 3.00 and it even came down to 2.40 before the escapees clearly hit the gas. In a matter of a few kilometres they added another 20 seconds to their advantage and they were 3.30 ahead when they entered the final 30km. Now it was time for the peloton to react and so Van Keirsbulck, Maciej Bodnar (Tinkoff-Saxo) and Matthews Brammeier (MTN-Qhubeka) also started to work. They added firepower paid off and with 20km to go, the gap had been reduced to 2.15. At this point, Hernandez, Brammeier, Velits and Vandenbergh had disappeared and it was left to Bodnar, Van Keirsbulck and Johann Van Zyl (MTN-Qhubeka) to set the pace. The three strong riders were riding a lot faster than the break and as they entered the final 15km, the gap was only 1.15. Van Zyl and Van Keirsbulck swung off and so Etixx-QuickStep were forced to Yves Lampaert who started to work with Bodnar. Moments later, Optum came to the fore to start the exciting finale.